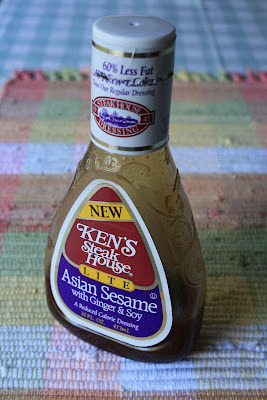 Meet my new best friend and my secret ingredient for speedy-quick great grilled chicken -- Ken's Asian Sesame with Ginger & Soy. And it's even lite, if you are so inclined! Still and all, nothing can beat my brother's special homemade secret sauce as a marinade or finishing sauce for fish, chicken and even sawdust, but a bottle of this stuff is good to have in the pantry -- just in case. Just thought you should know. I'd want you to tell me if you had a secret. Do you have a secret . . . sauce, that is? Want to share? Awww, come on. Thanks for the secret to great popcorn - what a good idea! I have so many secret ingredients but I'll give you one, that can be used in drinks and when marinating meats...Angostura bitters. Thanks for sharing your secret I'll try it next time. Hope you wouldn't mind having Foodista readers directed to your blog. Just add your choice of widget to this post and you're all set! Great tip! I'll be on the lookout for this one. My favorite salad dressing to dress up a regular salad is Annie's Papaya Poppyseed Vinagrette! Transforms ordinary into extraordinary!